What a shame the startling effect of a groundbreaking new film can be only felt by those who come to it first. 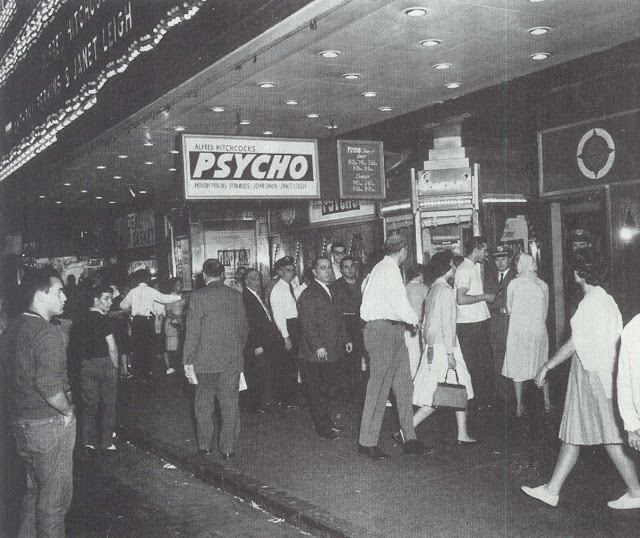 My initial exposure to Psycho was on television, so I’ll never relate to traumatized viewers wandering out of first-run New York theatres during that summer of 1960. Biggest problem with a life spent in adoration of classic movies is the fact you’ll never get the rocker punch folks received when these things were new. We can read about opening nights of Gone With The Wind, A Star Is Born, or House Of Wax, but never mind feeling what they felt, no matter the restorations placed before us. Chasing a sensation likened to that experienced long ago in crowded and excited auditoriums is pretty much what this site is about, tempered by realization we’ll never come within hailing distance armed with nothing other than yellowed ads, faded photos and a few memories. 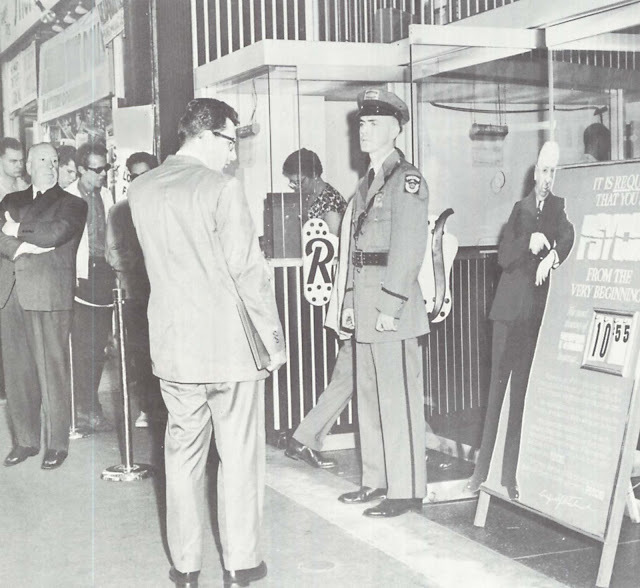 How many of even veteran moviegoers saw seminal shows on the front end? Southeastern venues were first to get Bonnie and Clyde and The Wild Bunch, long before these were discovered by a critical establishment (and prior to TWB being cut for general release length). My sole voyage of discovery, as in being among those truly first in line, took place in the summer of 1975, when our USC class was directed to a screening room on the Universal lot to see a brand new movie about sharks. Beyond that sketchy description, I had no information. Jaws wasn’t set to open for at least another two weeks, so we knew from nothing what lay in wait. I do remember screams among my classmates. For once in our spoiler-contaminated lives, we had no one to prepare us for the experience. I remember the film’s mechanical shark parked forlornly on a trailer as we crossed Universal's lot afterward. Just another prop awaiting storage, but fun encountering such a thing but steps from having watched the movie. 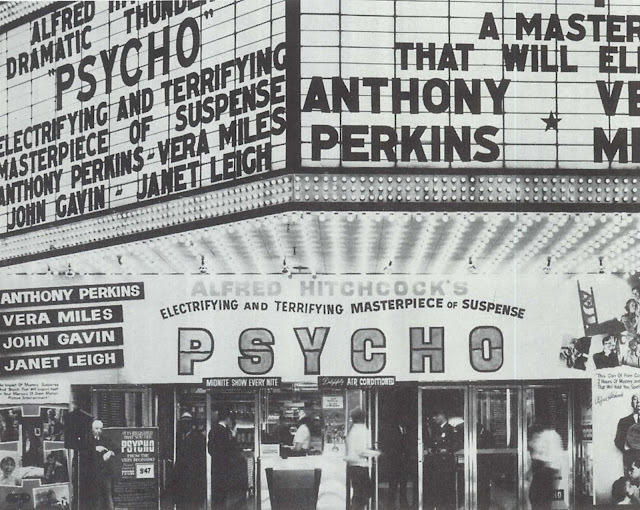 My digression here is just by way of imagining what a similar Psycho initiation might have been like --- entering those magic portals (and what striking marquees these are), knowing not that your senses are to be assailed in ways unknown to that time. Reliable accounts say many screamed and fled for home. Police were summoned to calm disturbances. I’ve read of such incidents during first-run engagements of Frankenstein in 1931, but weren’t we past this by 1960? May-be, but was this only because there’d been no one like Hitchcock to upend us anew? Psycho demonstrated it was still possible to shatter senses on a mass scale. Jaws has perhaps come closest since, but what else? Taking critics off the loop for advance screenings was nothing so radical in 1960, but barring exhibitors from same was a near declaration of war. 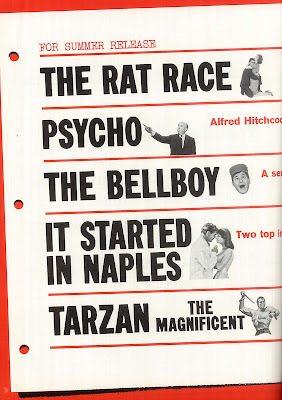 Who can help launch a film better than an exhibitor who has seen it?, asked Pete Harrison in his June 6, 1960 Reports. Paramount’s excuse can only make theatre-men suspicious of the hidden feature’s merit. Harrison despaired of Psycho’s critical fate as well. Furthermore, it is understood that Paramount will not screen the film for trade reviewers before it opens at a theatre. Under such conditions, even the fairest of critics will have trouble viewing the film objectively. 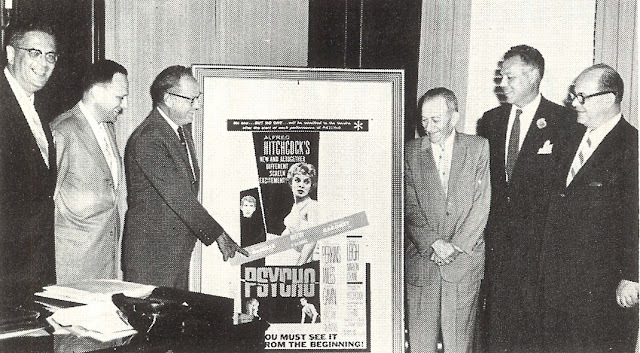 Indeed, Hitchcock had gambled his dollars (Psycho being largely self-financed), reputation, and showman good will in a go-for-broke campaign that might easily have backfired and cost the director everything he’d built up over a twenty-year period in the US. Had grosses not been so extraordinary, would the excesses here have finished Hitchcock’s career, as many predicted after seeing Psycho? It took nerve to put your name on the line for product rough as this, and where was assurance that audiences would sit still for it? 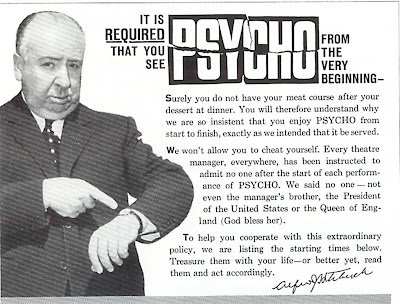 If ever a filmmaker read the pulse of his constituency, Hitchcock did that summer, for Psycho lured business vast beyond wildest expectation of ordinary shockers --- so much so as to suggest he’d invented a whole new genre. 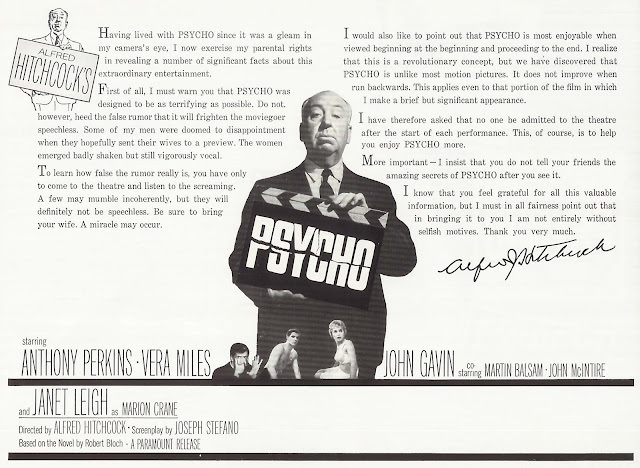 You could opt for a simplistic explanation and dismiss the new Hitchcock as merely an upscale William Castle, and indeed, he envisioned Psycho as a riposte to all those Hammer, AIP, and, yes, Castle films nipping at Master Of Suspense heels. 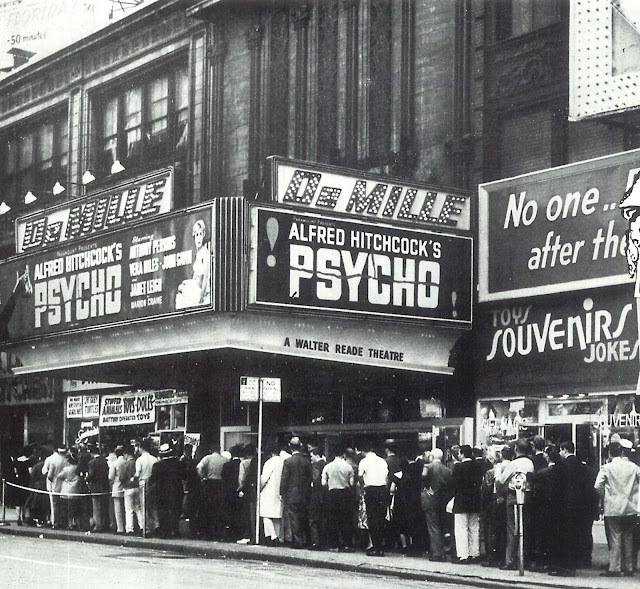 Summer of 1960’s release schedule is fun for the glimpse it affords of Psycho’s thriller competition. Bowing before and after Hitchcock was American-International’s House Of Usher (June), Universal/Hammer’s Brides Of Dracula (July), and Columbia’s 13 Ghosts (August). 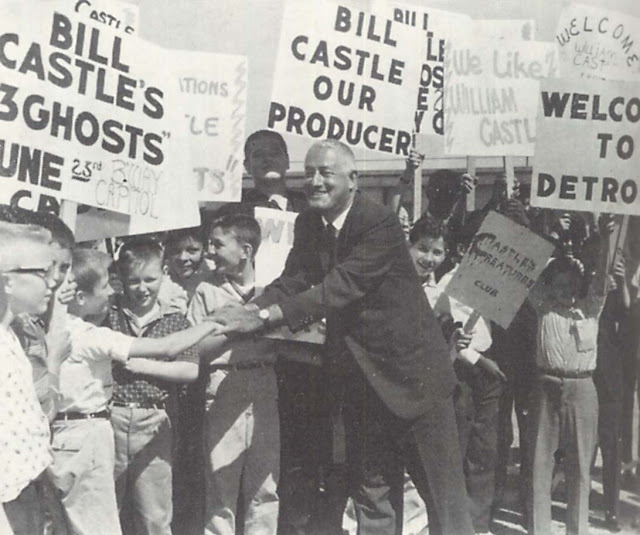 Castle (shown at top shilling for 13 Ghosts with moppet "fan club") was a particular thorn in Hitchcock’s side, as their marketing techniques often overlapped, and Hitchcock didn’t enjoy seeing his work confused with the likes of The Tingler and House On Haunted Hill (writer applicants to A.H. faced veto for having worked on previous Castle shows). Was Castle the Hitchcock doppelganger?Comparisons would end at the ticket window, for neither Castle nor fellow shockmeisters ever realized grosses approaching Psycho. This might have proven a mixed blessing for Hitchcock, as adult expectations of star-laden and more or less civilized suspense were now supplanted by newly-won youthful acolytes awaiting a topper to horrific thrills he’d furnished with Psycho, and later, The Birds. I distinctly recall the letdown attendant on my family’s beach outing to see Torn Curtain in August 1966. Owing to the reputation of Psycho and The Birds, this twelve-year old craved stronger meat than Paul Newman and Julie Andrews playing at tepid espionage behind Kremlin lines. Hitchcock was trapped in his own house on a haunted (Psycho) hill, and immature (if exacting) fans such as myself weren’t disposed to let him out. 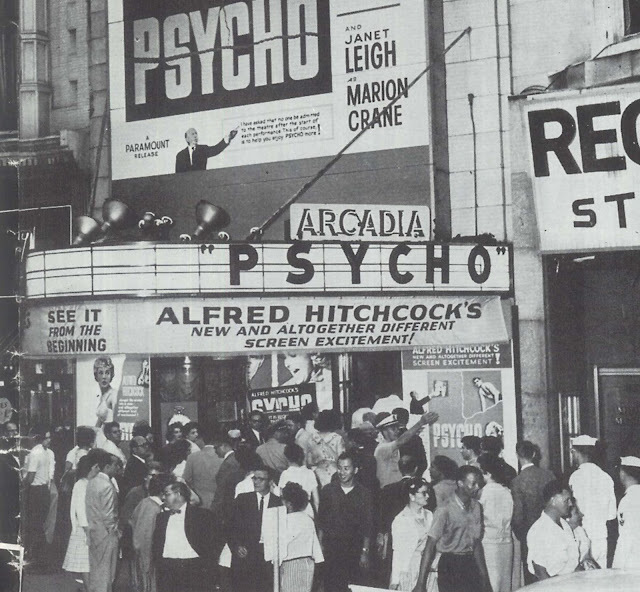 There was a pair of teaser trailers in addition to the six-minute deluxe wherein Hitchcock hosted a tour of the Bates Motel and environs. The latter attained legendary status and was bootlegged/sold by collectors for years to come. Universal included it among DVD extras, but the teasers have remained unseen. One was a plea urging top secrecy regarding the content of Psycho, while the other set forth policy for all bookings of the feature. See It From The Beginning was used since movies began, but never was it actually enforced with regards arriving patrons. Embattled showmen happy to get their quarters any way they could were alarmed to find these uncompromising terms written into Psycho contracts. 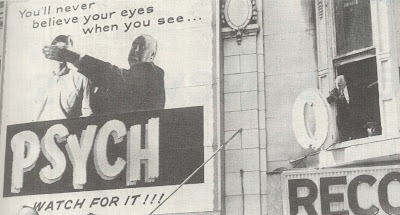 Our opening playdates have proved, beyond the shadow of a showman’s doubt, the success of this required policy, said Hitchcock in a trade appeal to exhibitors. If the word "required" startles you, please try to think of a box office besieged by patrons anxious to purchase tickets. Feel better? Hitchcock forecast theatre owners happily startled all the way to the bank if only they’d comply with his absolute bar against late arrivals to Psycho. For first-run houses with definite start schedules (several shown here), this was well and good, and promotional budgets at metro venues allowed for stunt emphasis on Hitchcock’s edict (Pinkerton guards, off-duty officers, etc. ), but what of grind situations down the line where double and triple billing prevailed and start times were uncertain at best? My guess is the policy was abandoned after the first month or so of general release, though scrambling for prints of Psycho aroused the ire of circuit heads denied early run privileges. Here is a black-and-white picture for which Paramount could make up at least 100 more prints for "peanuts" and take advantage of the publicity the picture is now receiving, said Allied Theatre’s North Central president. It could then be booked into the smaller towns and earn thousands of more dollars and help keep the small-town exhibitor alive. The problem of popular titles going stale before less populated areas could get them was an ongoing grievance among rural showmen --- Can the revenue derived from the comparatively few who are lured from their communities to the big cities possibly compensate the film company for the losses resulting from the local theatres’ lessened prestige and the positive manner in which such sales policies date a picture and render it passe in the minds of local theatergoers? The backlash stung as Psycho limped its way into the sticks. Not as good as William Castle’s "Macabre" was manager Chuck Gerard’s dismissal in the wake of patrons’ migration to catch Psycho in Iowa City or St. Louis rather than wait months for Warsaw, Illonois’ modest house to book a date. Check Your Watch! Can't come in if you're late! That IS Vera Miles, right? What happen to glamour mondays???????????????? That is Vera Miles at the end of the "Psycho" trailer, and another Glamour Starter is coming soon. I remember when the first network showing was cancelled due to that murder, but I won't spoil the details for others who are out of the loop. Suffice it to say, I was mighty disappointed -- and, honestly, never saw the connection between the two. You will have to excuse my ignorance, but you run a movie theatre also? It's a campus theatre, not a commercial one, and I don't actually run it. If I did, there'd be no time to write posts for GPS! Oh man, wish I could have been at that campus theatre! Damn my California zip code! 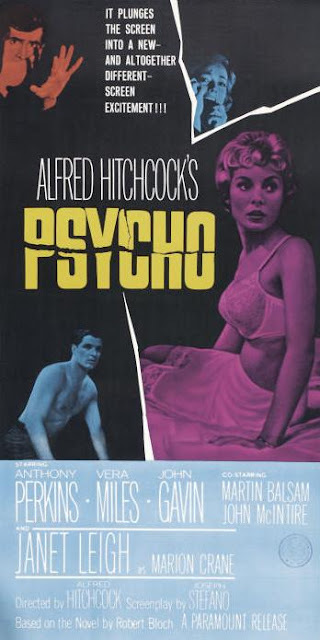 "Psycho" still gets credit for being my favorite movie; although others may have passed it (including "Frankenstein"/"Bride of Frankenstein"), it's what sparked my interest in old movies. I rented it with my dad from Blockbuster when I was 11 (this was 1998), and although I knew the ending had already been ruined for me during a 1995 tour of Universal Studios, I still loved it! I was completely obsessed with it for a couple of months, then I branched out to the other Hitchcocks and old movies. Even though I knew the ending, I still found it very effective; it scared the heck out of my 9-year-old brother, who also knew the ending, but hadn't expected Mrs. Bates to look so scary! Wow, I managed to ramble on for a while. Anyway, great post as always.